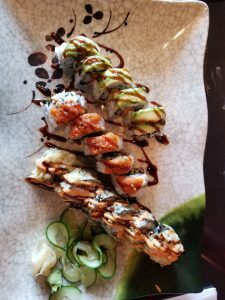 The Lafayette area has a surprising number of good sushi restaurants given how far we are from the ocean. But it’s an overabundance that I won’t complain about. 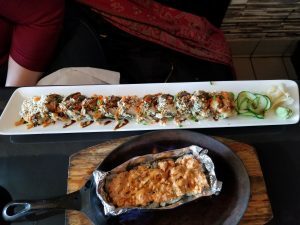 I recently went to Fishya — a “hidden” sushi restaurant in the Purdue West Shopping Plaza. Located on McCutcheon Drive, you’re not likely to drive by it accidentally, but it’s worth making the trip on purpose. Fishya has split hours: it’s open for lunch and dinner, but not in between or on Mondays. The lunch and dinner menus vary a little bit. Lunch features a set of rolls named after Purdue buildings, and since I was there for lunch, I felt like I was obligated to order from there. But first: an appetizer. The “heart attack” is a jalapeño stuffed with spicy tuna and cream cheese. It’s cut lengthwise, so it’s a little bit cumbersome to eat. Even though my first one had to be wiped off the table, I really enjoyed it. The miso soup seemed off somehow. It was serviceable, if tepid, but it just had a muted taste. Heart Attack appetizer at Fishya. Then came the rolls. I got the Young Hall, the Armstrong Hall , and the Mackey Arena rolls. The Young Hall roll was as bland as my office in the namesake building. It was nice, and did what I needed, but wasn’t anything particularly special. The asparagus in the Mackey Arena roll provided a nice crunch. But the Armstrong Hall roll was the best of the three. It was creamy, which paired well with the deep fry. Young Hall, Mackey Arena, and Armstrong Hall rolls. My friend ordered the Anthony roll — which comes out ablaze — and the Godzilla roll. The sweet chili sauce and spicy mayo that top the Anthony roll made it very creamy. 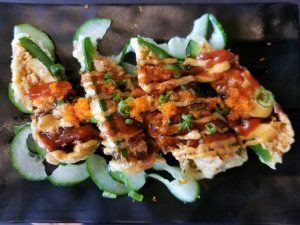 The Godzilla roll is appropriately huge, with a taste to match. Godzilla roll and Anthony roll. I appreciated the smoothest of smooth jazz music when I walked in. The restaurant is comfortable — enough room that you don’t feel crowded without being wide open. Prices are pretty comparable to other sushi restaurants in the area. I’d like to go back soon to try some of the other menu items, including the bibimbap, ramen, and hot pots.